Another of Britain's prestigious art institutions has decided to shun donations from the US Sackler family. The Tate's board of trustees said it would decline further donations, which comes after the withdrawal of a £1m National Portrait Gallery grant. The BBC's arts editor, Will Gompertz, said the Tate's move was "a significant moment in this ongoing story". "It makes it very difficult for any other arts organisation to accept Sackler money," he said. "It also implicitly puts pressure on recent recipients of its donations. " The Sackler family has "vigorously denied" the allegations against it. But the institution said in a statement: "The Sackler family has given generously to Tate in the past, as they have to a large number of UK arts institutions. "We do not intend to remove references to this historic philanthropy. However, in the present circumstances we do not think it right to seek or accept further donations from the Sacklers." 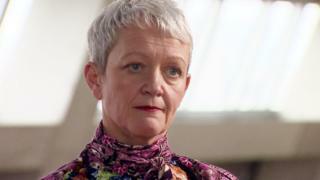 In an interview with BBC's Newsnight, Tate director Maria Balshaw said the group's ethics committee always considered where money came from and its decisions were made on a case by case basis. "Reputational issues are something that's part and parcel of life of running an organisation like this one... you can't not think about these issues," she said. The US Centres for Disease Control and Prevention has said that opioids - a class of drug which includes everything from heroin to legal painkillers - were involved in almost 48,000 deaths in 2017. And President Donald Trump has called the US opioid epidemic a "national shame" and declared it a public health emergency.